Most of my friends don't care for Barack Obama. Let me rephrase that: most of my friends strongly disagree with many of President Obama's policy decisions. Sometimes this turns into outright dislike for the man himself (even though they haven't actually met him), and occasionally it causes some of them to teeter over into the zone where people believe that he is not a legitimate President because of where they think he was born, or that he is a militant Muslim of some kind trying to overthrow freedom of religion, or some other difficult-to-prove but inflammatory viewpoint. Most of my friends seem to be quite indignant at any suggestion that gun control is a good idea. They are angry when they perceive the President and members of Congress using tragedies as a way to promote what could be seen as a reduction in freedoms. They are incensed if someone says "...one nation..." and does not follow it up with "...under God...". They dislike Obama's foreign policies and his domestic policies. They were quite disappointed when he was elected again, although as I mentioned right after the election, I was quite proud of their response afterward. I don't mean to distance myself from their viewpoints... as is often the case among friends, I share some of their concerns. What I am trying to do is paint a quick picture of the mindset of the Christian who is also politically right-leaning. Based on things I see on Facebook, comments posted on YouTube videos of political nature, responses to online news articles, and that sort of thing, there seem to be a lot of Christians who think that sin is dragging this country to its grave. And they are pointing their fingers at the "sinners" (Congressmen, abortionists, gun-control activists, Obama supporters, etc.) who they believe are the cause of it. Last night I was reading the book of Daniel, and I came to a place where Daniel began to pray. 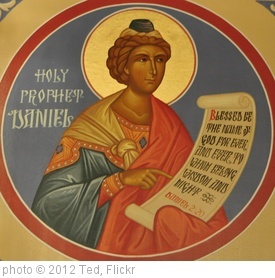 Daniel was in forced exile from his country of Israel, but he knew that the reason for his exile was the sin of the Jewish nation, and Daniel began to pray for his country. I invite you to take a look at his prayer in Daniel 9:3-19 to see what he said. Do you know what I noticed last night as I read it? Although Daniel was one of the most righteous among his people (remember, he was the guy who wound up getting thrown to the lions because he refused to betray God and pray to the king), Daniel did not pray to confess the sins of others. He confessed and asked for forgiveness of the sins of his country, including himself. He did not differentiate between idolaters back home dancing around on the hilltops making sacrifices to Baal, and himself, stuck in Babylon but praying three times a day facing Jerusalem. "We have not listened to your servants the prophets, who spoke in your name to our kings, our princes, and our fathers, and to all the people of the land," he prayed, despite the fact that his prayer was in response to his own reverent reading of the writings of the prophet Jeremiah. He included himself among the ranks of those who "...have rebelled against [God] and have not obeyed the voice of the Lord our God by walking in his laws, which he set before us by his servants the prophets," despite the fact that Daniel was so careful to follow God's Law that years earlier when he was brought to Babylon in captivity, Daniel had "...resolved that he would not defile himself with the king's food, or with the wine that he drank," risking his life in the process. Although Daniel appears to have been quite a meticulous follower of God, certainly not someone we would look on as a "transgressor", he prayed as though he were. Because he knew that he was a member of God's people, and a member of his country, and he knew that they would live or die as a unit. "United we stand, divided we fall." That's a good motto. If we point at someone else as the one who is messing everything up, we divide ourselves from others around us... we become a divided country. That sort of thing is what caused the awful "Civil War" that nearly destroyed us once. The United States of America is not quite like Israel... a nation primarily of one ethnicity and chosen specifically by God to be His people. I don't think the United States is chosen to be God's nation; I think the Church (meaning all Christians across the world) is now ultimately God's nation, His "Kingdom." But I do think that Christians should take a play out of Daniel's playbook and call out to God for forgiveness of the sins we have committed as an earthly nation, humbling ourselves as though we are among the transgressors. Because really, we are. Every time an official or governing body we have elected to represent us makes an ungodly decision, we have made that decision by proxy. And "I didn't vote for him" is no excuse. United we stand; divided we fall. I personally don't think that we (the United States) will ever be able to right every wrong that we have committed or will commit as a country; I'm not sure that is even possible for any country. But if we seek God's face as His people and pray for the cleansing of our country, I think God will honor our prayers and we will see change for the better. And if we take the attitude that we are all Americans and dispose of the "us vs. them" mentality which has plagued us for the past few decades, it's possible that maybe some of "them" might come to Jesus and become "us". Or, we may find that although we may disagree on some of the details of politics, some of "them" actually turn out to be some of "us" already. But whether we all come to a consensus on political, ideological, or religious ideas (fat chance!) or not, we are all "us". We are all America. The UNITED States. If we become divided because we disagree, we risk failure. If we remain united, we as a nation can remain strong. Very good word! I have noticed that about Daniel as well. I homeschool my children and have been studying Rome with my 7th grader this year, and I see this same division worked back then to crumble The Roman Republic. Then in steps someone who can supposedly solve things, Julius Caesar, and he becomes a tyrant.